Drywall (also known as plasterboard, wallboard, sheet rock, gyprock, gypsum board, or gypsum panel) is a panel made of calcium sulfate dihydrate (gypsum), with or without additives, typically extruded between thick sheets of facer and backer paper, used in the construction of interior walls and ceilings. The plaster is mixed with fiber (typically paper, fiberglass, asbestos, or a combination of these materials), plasticizer, foaming agent, and various additives that can reduce mildew, flammability, and water absorption. Drywall construction became prevalent in North America as a time and labor saving alternative to traditional lath and plaster. The first plasterboard plant in the UK was opened in 1888 in Rochester, Kent. Sackett Board was invented in 1894 by Augustine Sackett and Fred Kane, graduates of Rensselaer Polytechnic Institute. It was made by layering plaster within four plies of wool felt paper. Sheets were 36 by 36 by 1⁄4 inch (91.44 cm × 91.44 cm × 0.64 cm) thick with open (untaped) edges. Gypsum board evolved between 1910 and 1930 beginning with wrapped board edges and elimination of the two inner layers of felt paper in favor of paper-based facings. In 1910 United States Gypsum Corporation bought Sackett Plaster Board Company and by 1917 introduced Sheetrock. Providing efficiency of installation, it was developed additionally as a measure of fire resistance. Later air entrainment technology made boards lighter and less brittle, and joint treatment materials and systems also evolved. Gypsum lath was an early substrate for plaster. An alternative to traditional wood or metal lath, it was a panel made up of compressed gypsum plaster board that was sometimes grooved or punched with holes to allow wet plaster to key into its surface. As it evolved, it was faced with paper impregnated with gypsum crystals that bonded with the applied facing layer of plaster. In 1936 US Gypsum trademarked ROCKLATH for their gypsum lath product. In 2002 the European Commission imposed fines totaling €478 million on the companies Lafarge, BPB, Knauf and Gyproc Benelux, which had operated a cartel on the market which affected 80% of consumers in France, the UK, Germany and the Benelux countries. A wallboard panel consists of a layer of gypsum plaster sandwiched between two layers of paper. The raw gypsum, CaSO4·2 H2O, is heated to drive off the water then slightly rehydrated to produce the hemihydrate of calcium sulfate (CaSO4·​1⁄2 H2O). 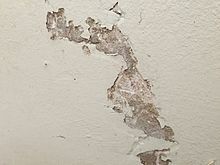 The plaster is mixed with fibre (typically paper and/or fibreglass), plasticizer, foaming agent, finely ground gypsum crystal as an accelerator, EDTA, starch or other chelate as a retarder, various additives that may decrease mildew and increase fire resistance, and wax emulsion or silanes for lower water absorption. The board is then formed by sandwiching a core of the wet mixture between two sheets of heavy paper or fibreglass mats. When the core sets it is then dried in a large drying chamber, and the sandwich becomes rigid and strong enough for use as a building material. Drying chambers typically use natural gas today. To dry 1 MSF (1,000 square feet (93 m2)) of wallboard, between 1,750,000 and 2,490,000 BTU (1,850,000 and 2,630,000 kJ) is required. Organic dispersants/plasticisers are used so the slurry will flow during manufacture, and to reduce the water and hence the drying time. Coal-fired power stations include devices called scrubbers to remove sulphur from their exhaust emissions. The sulphur is absorbed by powdered limestone in a process called flue-gas desulphurization (FGD), which produces a number of new substances. One is called "FGD gypsum". This is commonly used in drywall construction in the United States and elsewhere. Drywall panels in the United States are manufactured in 48,-54,-and-96-inch (1.2, 1.4, and 2.4 m) wide panels in varying lengths to suit the application, though 48-inch is by far the most common width. Lengths up to 16 feet (4.9 m) are commonly available, though the most common length is 8 feet (2.4 m). Common panel thicknesses are 1⁄2 and 5⁄8 inch (13 and 16 mm), and 1⁄4, 3⁄8, 3⁄4, and 1 inch (6.4, 9.5, 19.1, and 25.4 mm) thicknesses are also used in specific applications. In Europe, most plasterboard is made in 120-centimetre-wide (3 ft 11 in) sheets, though 60-and-90-centimetre-wide (2 ft 0 in and 2 ft 11 in) sheets are also made. Plasterboard 120 cm wide is most commonly made in 240 centimetres (7 ft 10 in) lengths, though 250, 260, 270, 280, and 300 centimetres (8 ft 2 in, 8 ft 6 in, 8 ft 10 in, 9 ft 2 in, and 9 ft 10 in) or longer (if ordered) are commonly available. Thicknesses of plasterboard available are 9.5 to 25 millimetres (3⁄8 to 1 in). The term plasterboard is used in Australia and New Zealand, and in the latter country it is also known as Gibraltar board; it is manufactured in thicknesses of 10 mm, 13 mm, and 16 mm, and sometimes other thicknesses up to 25 mm. Panels are commonly sold in 1200 × 2400 mm, 1200 × 4800 mm, and 1200 × 6000 mm sheets. Sheets are usually secured to either a timber or cold-formed steel frames anywhere from 150 to 300 mm centres along the beam and 400 to 600 mm across members. Various companies, such as Boral and CSR, manufacture plasterboard under various brand names including Gyprock. As an alternative to a week-long plaster application, an entire house can be drywalled in one or two days by two experienced drywallers, and drywall is easy enough to use that it can be installed by many amateur home carpenters. In large-scale commercial construction, the work of installing and finishing drywall is often split between the drywall mechanics, or hangers, who install the wallboard, and the tapers and mudmen, or float crew, who finish the joints and cover the fastener heads with drywall compound. Dry wall can be finished anywhere from a level 0 to a level 5, where 0 is not finished in any fashion and 5 is the most "pristine". Depending on how significant the finish is to the customer the extra steps in the finish may or may not be necessary, though priming and painting of drywall is recommended in any location where it may be exposed to any wear. Drywall is cut to size, using a large T-square, by scoring the paper on the finished side (usually white) with a utility knife, breaking the sheet along the cut, and cutting the paper backing. Small features such as holes for outlets and light switches are usually cut using a keyhole saw or a small high-speed bit in a rotary tool. Drywall is then fixed to the wall structure with nails or drywall screws and often glue. Drywall fasteners, also referred to as drywall clips or stops, are gaining popularity in both residential and commercial construction. Drywall fasteners are used for supporting interior drywall corners and replacing the non-structural wood or metal blocking that traditionally was used to install drywall. Their function serves to save on material and labour expenses, to minimize call-backs due to truss uplift, to increase energy efficiency, and to make plumbing and electrical installation simpler. When driven fully home, drywall screws countersink their heads slightly into the drywall. They use a 'bugle head', a concave taper, rather than the conventional conical countersunk head; this compresses the drywall surface rather than cutting into it and so avoids tearing the paper. Screws for light-gauge steel framing have an acute point and finely spaced threads. If the steel framing is heavier than 20-gauge, self-tapping screws with finely spaced threads must be used. 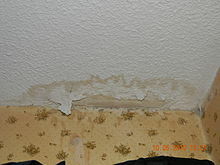 In some applications, the drywall may be attached to the wall with adhesives. The method of installation and type of drywall can reduce sound transmission through walls and ceilings. Several builders' books state that thicker drywall reduces sound transmission, but engineering manuals recommend using multiple layers of drywall, sometimes of different thicknesses and glued together, or special types of drywall designed to reduce noise. Also important are the construction details of the framing with steel studs, wider stud spacing, double studding, insulation, and other details reducing sound transmission. Sound transmission class (STC) ratings can be increased from 33 for an ordinary stud-wall to as high as 59 with double 1⁄2-inch (13 mm) drywall on both sides of a wood stud wall with resilient channels on one side and fiberglass batt insulation between the studs. Sound transmission may be slightly reduced using regular 5⁄8-inch (16 mm) panels (with or without light-gauge resilient metal channels and/or insulation), but it is more effective to use two layers of drywall, sometimes in combination with other factors, or specially designed, sound-resistant drywall. It is for these reasons that greenboard and ideally cement board are used for rooms expected to have high humidity, primarily kitchens, bathrooms, and laundry rooms. A substantial amount of defective drywall was imported into the United States from China and incorporated into tens of thousands of homes during rebuilding in 2006 and 2007 following Hurricane Katrina and in other places. Complaints included foul odour, health effects, and corrosion of metal within the structure. This is caused by the emission of sulphurous gases. The same drywall was sold in Asia without problems resulting, but U.S. homes are built much more tightly than homes in China, with less ventilation. Volatile sulphur compounds, including hydrogen sulphide, have been detected as emissions from the imported drywall and may be linked to health problems. These compounds are emitted from many different types of drywall. A number of lawsuits are underway in many jurisdictions, but many of the sheets of drywall are simply marked, "Made in China", thus making identification of the manufacturer difficult. An investigation by the Consumer Product Safety Commission, CPSC, was underway in 2009. In November 2009, the CPSC reported a "strong association" between Chinese drywall and corrosion of pipes and wires reported by thousands of homeowners in the United States. The issue was resolved in 2011 and now all drywall must be tested for volatile sulfur and any containing more than 10 ppm is unable to be sold in the US. Drywall is made primarily from gypsum (CaSO4•2H2O). As its chemical formula shows, gypsum contains chemically combined water (approximately 50% by volume). When gypsum panels are exposed to fire, heat is absorbed as a portion of the combined water is driven off as steam. This chemical process is called calcination. The thermal energy that converts the water to steam is thus diverted and absorbed, keeping the opposite side of the gypsum panels cool as long as there is crystalline water left to be converted into steam or until the gypsum panel is breached. In the case of regular gypsum board, as the crystalline water is driven off, the reduction of volume within the gypsum core causes large cracks to form, eventually causing the panel to fail due to loss of structural integrity. This is similar to the cracking that can be observed in a dry lake or river bed. When used as a component in fire barriers, drywall is a passive fire protection item. In its natural state, gypsum contains the water of crystallization bound in the form of hydrates. When exposed to heat or fire, this water is vaporized, over a range of temperatures from 80 to 170 °C (176 to 338 °F) (see calcium sulphate), retarding heat transfer until the water in the gypsum is gone. This makes drywall an ablative material because as the hydrates sublime, a crumbly dust is left behind, which, along with the paper, is sacrificial. Generally, the more layers of Type X drywall one adds, the more one increases the fire-resistance of the assembly, up to four hours for walls and three hours for ceilings. Evidence of this can be found both in publicly available design catalogues, including DIN 4102 Part 4 and the Canadian Building Code on the topic, as well as common certification listings, including certification listings provided by Underwriters Laboratories and Underwriters Laboratories of Canada (ULC). "Type X" drywall is formulated by adding glass fibres to the gypsum, to increase the resistance to fires, especially once the hydrates are spent, which leaves the gypsum in powder form. Type X is typically the material chosen to construct walls and ceilings that are required to have a fire-resistance rating. Fire testing of drywall assemblies for the purpose of expanding national catalogues, such as the National Building Code of Canada, Germany's Part 4 of DIN4102 and its British cousin BS476, are a matter of routine research and development work in more than one nation and can be sponsored jointly by national authorities and representatives of the drywall industry. For example, the National Research Council of Canada routinely publishes such findings. The results are printed as approved designs in the back of the building code. 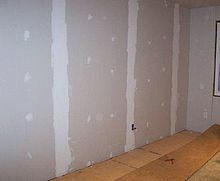 Generally, exposure of drywall on a panel furnace removes the water and calcines the exposed drywall and also heats the studs and fasteners holding the drywall. This typically results in deflection of the assembly towards the fire, as that is the location where the sublimation occurs, which weakens the assembly, due to the fire influence. It's important to consider deflection of drywall assemblies to maintain their assembly integrity to preserve their ratings. Deflection of drywall assemblies can vary somewhat from one test to another. Importantly, penetrants do not follow the deflection movement of the drywall assemblies they penetrate. For example, see cable tray movement in a German test. It is, therefore, important to test firestops in full scale wall panel tests, so that the deflection of each applicable assembly can be taken into account. The size of the test wall assembly alone is not the only consideration for firestop tests. If the penetrants are mounted to and hung off the drywall assembly itself during the test, this does not constitute a realistic deflection exposure insofar as the firestop is concerned. In reality, on a construction site, penetrants are hung off the ceiling above. Penetrants may increase in length, push and pull as a result of operational temperature changes (e.g., hot and cold water in a pipe), particularly in a fire. But it is a physical impossibility to have the penetrants follow the movement of drywall assemblies that they penetrate, since they are not mounted to the drywalls in a building. Drywall provides a thermal resistance R-value (in US units) of 0.32 for ​3⁄8-inch board, 0.45 for ​1⁄2-inch, 0.56 for ​5⁄8-inch, and 0.83 for 1-inch board. In addition to increased R-value, thicker drywall has a higher sound transmission class. In Type X gypsum board, special glass fibers are intermixed with the gypsum to reinforce the core of the panels. These fibers have the effect of reducing the size of the cracks that form as the water is driven off, thereby extending the length of time the gypsum panels resist fire without failure. Type C gypsum panels provide even greater fire resistance than Type X. As with the Type X panels, the core of the Type C panels contains glass fibers, only in a much higher percent by weight. In addition to the greater amount of glass fiber, the core of the Type C panels also contains vermiculite, which acts as a shrinkage-compensating additive that expands when exposed to elevated temperatures of a fire. This expansion occurs at roughly the same temperature as the calcination of the gypsum in the core. It allows the core of the Type C panels to remain dimensionally stable in the presence of fire, which in turn allows the panels to remain in place for a longer period of time even after the combined water has been driven off. North America is one of the largest gypsum board users in the world with a total wallboard plant capacity of 42 billion square feet (3.9 billion square metres) per year, roughly half of the worldwide annaul production capacity of 85 billion square feet (7.9 billion square metres). 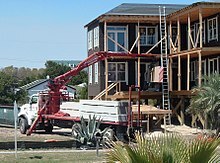 Moreover, the homebuilding and remodeling markets in North America in the late 1990s and early 2000s increased demand. The gypsum board market was one of the biggest beneficiaries of the housing boom as "an average new American home contains more than 7.31 metric tons of gypsum." The introduction in March 2005 of the Clean Air Interstate Rule by the United States Environmental Protection Agency requires fossil-fuel power plants to "cut sulfur dioxide emissions by 73%" by 2018. The Clean Air Interstate Rule also requested that the power plants install new scrubbers (industrial pollution control devices) to remove sulfur dioxide present in the output waste gas. Scrubbers use the technique of flue-gas desulfurization (FGD), which produces synthetic gypsum as a usable by-product. In response to the new supply of this raw material, the gypsum board market was predicted to shift significantly. However, issues such as mercury release during calcining need to be resolved. Foil-backed drywall used as a vapor barrier. Controlled density (CD), also called ceiling board, which is available only in 1⁄2 inch (13 mm) thickness and is significantly stiffer than regular white board. EcoRock, a drywall that uses a combination of 20 materials including recycled fly ash, slag, kiln dust and fillers and no starch cellulose; it is advertised as being environmentally friendly due to the use of recycled materials and an energy efficient process. Gypsum "Firecode C". This board is similar in composition to Type X, except for more glass fibres and a form of vermiculite, used to reduce shrinkage. When exposed to high heat, the gypsum core shrinks but this additive expands at about the same rate, so the gypsum core is more stable in a fire, and remains in place even after the gypsum dries up. Because up to 12% of drywall is wasted during the manufacturing and installation processes and the drywall material is frequently not re-used, disposal can become a problem. Some landfill sites have banned the dumping of drywall. Some manufacturers take back waste wallboard from construction sites and recycle it into new wallboard. Recycled paper is typically used during manufacturing. More recently, recycling at the construction site itself is being researched. There is potential for using crushed drywall to amend certain soils at building sites, such as sodic clay and silt mixtures (bay mud), as well as using it in compost. As of 2016, industry standards are being developed to ensure that when and if wallboard is taken back for recycling, quality and composition are maintained. ^ "Definition of PLASTERBOARD". www.merriam-webster.com. Archived from the original on 2015-02-18. ^ "Preservation Brief 21: Repairing Historic Flat Plaster-Walls and Ceilings". Nps.gov. Archived from the original on 2014-04-28. Retrieved 2014-05-31. ^ Powell, Jane, and Linda Svendsen. Bungalow details: interior. Salt Lake City: Gibbs Smith, 2006. Print. 53-54. ^ "Drywall". DrywallTips.org. Retrieved 2010-12-03. ^ "Repairing Historic Flat Plaster Walls and Ceilings By The Old House Web". Oldhouseweb.com. Archived from the original on 2013-04-16. Retrieved 2013-04-20. ^ "European Commission - PRESS RELEASES - Press release - Commission imposes heavy fines on four companies involved in plasterboard cartel". europa.eu. Archived from the original on 2015-12-22. Retrieved 2016-03-28. ^ "Gypsum (FGD) Explored - Coal Combustion By-Products (CCBs) - calcium sulphate hydrate, scrubber sludge, FGD gypsum, synthetic gypsum - Kentucky Ash Education Site - UK CAER". Caer.uky.edu. 2013-04-12. Archived from the original on 2013-08-01. Retrieved 2013-04-20. ^ "Page Not Found! - Energy & Environmental Research Center". www.undeerc.org. Archived from the original on 2012-01-16. ^ Hegger, Manfred. Construction materials manual l. Basel: Birdhouse ;, 2006. Print. 60. ^ Taonga, New Zealand Ministry for Culture and Heritage Te Manatu. "Fixing Gibraltar board". www.teara.govt.nz. Archived from the original on 2014-08-10. ^ Ballou, Glen. Handbook for sound engineers. 3rd ed. Boston: Focal, 2002. Print. 73-77. ^ Lindeburg, Michael R. Mechanical engineering reference manual for the pe exam. S.l. : Professional Publications, 2013. Print. Table 73.6 p. 73-10. ^ Ballou, Glen. Handbook for sound engineers. 3rd ed. Boston: Focal, 2002. Print. 75-76. ^ "What is Greenboard Drywall". Homerenovations.about.com. 2013-02-05. Archived from the original on 2013-04-14. Retrieved 2013-04-20. ^ USG Corporation. The gypsum construction handbook. 7th ed. Kingston, MA: R. S. Means ;, 2014. Print. ^ "Magnesium Oxide Board? - Mgo Board Suppliers Uk and Europe". mgoboard.org. Archived from the original on 2017-12-06. Retrieved 2017-03-31. ^ "Mineral Commodity Summaries, January 2006" (PDF). Archived (PDF) from the original on 2013-03-16. Retrieved 2013-04-20. ^ "Clean Air Interstate Rule". Epa.gov. Archived from the original on 2013-04-12. Retrieved 2013-04-20. ^ "Mercury Release from FGD Gypsum" (PDF). Archived (PDF) from the original on 2012-09-03. Retrieved 2013-04-20. ^ "Plasterboard | Gyproc Moisture Resistant | Saint-Gobain Gyproc Products". Saint-gobaingyproc.in. Archived from the original on 2011-05-29. Retrieved 2013-04-20. 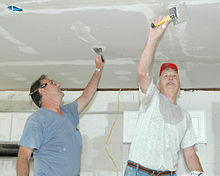 ^ Ferguson, Myron R.. Drywall: professional techniques for great results. Rev. and updated. ed. Newtown, CT: Taunton Press, 2002. Print. 11. ^ X-ray shielding. Washington, D.C.: Headquarters, Dept. of the Army, 1966. Print. 12. ^ Ferguson, Myron R.. Drywall: professional techniques for great results. Rev. and updated. ed. Newtown, CT: Taunton Press, 2002. Print. 15. ^ Serious Materials EcoRock Archived 2012-10-05 at the Wayback Machine. Popular Science. ^ "Recycled Inerts". Web.archive.org. Archived from the original on November 20, 2009. Retrieved 2013-04-20. Wikimedia Commons has media related to Drywall.